I was walking over pebbles: an endless stretch of them with a rhythmic sound of flowing water in the distance.In the wee hours of the morning, this was such a task. Who would want to get up so early during holidays? Cribbing and sulking, with one hand firmly held by grandpa, (lest I wriggle away) and one clutching a shiny, smooth, perfectly rounded pebble. In Rishikesh, a quarter century ago, this was the norm. A long walk, parallel to the ashram, nestled in the woods, leading to the roaring Ganges: a simple life, reeking of discipline. I am walking on pebbles again. 20 years later. This time alone. As I saw the first streak of the sun over the mountains, I wasn’t complaining getting up early in the morning. It was my personal rendezvous with the roaring Ganga, glistening in the sun, as it flowed merrily over the rocks, gushing downwards. I have a pebble in my hand, even now: a maroon one, polished and rounded, as I begin my day conversing with the pristine Ganga during my stay at the luxurious Neemrana property: The Glasshouse on the Ganges, off Rishikesh. At this 21st century, heritage property, which was once the hunting guesthouse of the Tehri kings, nostalgia swept over me as I walked under gigantic Litchi trees and mango orchards. Childhood memories of plucking litchis and mangoes came gushing back , while I walked in the tranquil and picturesque environs of the property. The ONE thing that gives you constant company at the Glasshouse on the Ganges, is the mellifluous sound of the Ganga and of course the serene views of the greenish blue waters peeping through the foliage. My room at Cottage 3, is named Karnali and the balcony opens up to an astounding view that I could live with till eternity. Yes, a private balcony with a wooden porch and French windows giving the room an airy feel. I settle down in the chair, reading a book as little birdies chirp, perched on the sill. The scene is straight out of a book, no disturbances, (only distractions: read ‘views’). My heart hops in the verandah, just like the little birdie. Because it is truly happy, seeing Ganga bubbling away to glory, not miserable like in Varanasi. The water is sparkling clean, just the way it deserves to be and with mountains all around, it requires a great deal of motivation to vacate my precious balcony spot and call it a day. While luxury is a good thing, one thing I absolutely detest about 5 star hotel properties is something as trivial yet extremely vital at the same time: the Beds. Unlike the bulky, ultra soft beds which end up giving you a backache , the beds at Neemrana’s Glasshouse on the Ganges are the ones that don’t make you miss home. While I am head over heels in love with Karnali, I really want to see the other rooms in the property. There are five cottages and each has a different layout from the other, giving it a non uniform feel and making the property live upto the non-Hotel Hotel tag. There are rooms which are Ganga facing, non Ganga facing, semi Ganga facing and the best view undoubtedly is from the tents. There are two tents and the proximity to the river has to be witnessed to be believed. 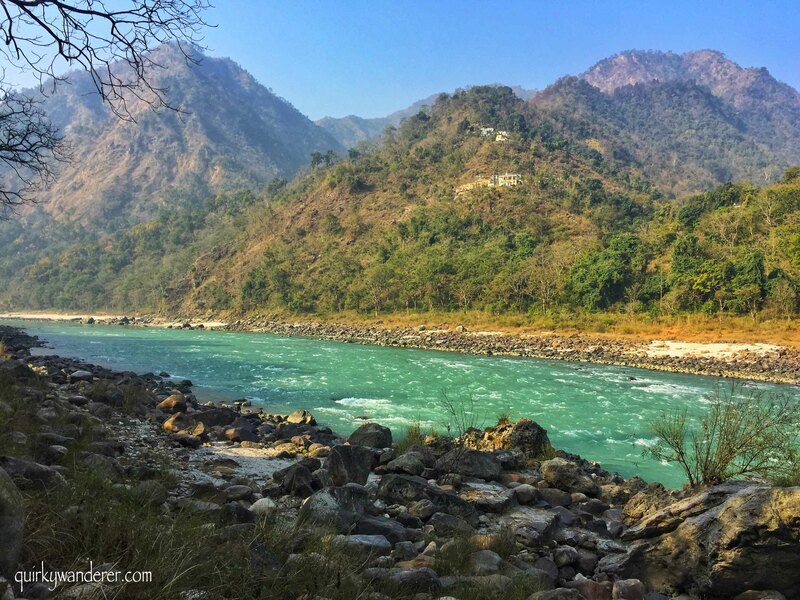 The tents are literally over the Ganges and as one stands outside the tent, you get a 180 degree view of the pristine Ganges flowing, till it turns a sharp 90 degree towards Rishikesh ( this is said to be the first 90 degree turn that she takes from Gangotri). Kids are not allowed to stay in the tents for safety reasons. Each room has vintage feels, with traditional furniture: antique almirahs, royal king and queen beds and colonial style dressing tables. Each subtly reiterating, that you are staying in a heritage property, not merely a luxury hotel. The crunchy, fresh lettuce in my sandwich came from the lettuce beds under my balcony, I am told by Mr. Gajendra, the manager at Glasshouse, as I start my brumal morning, having breakfast in the lawns overlooking the Ganga. Lazy afternoons are celebrated with perfectly baked thin crust pizza loaded with vegetables and mornings are kickstarted with an overdose of fresh orange juice, adding zing to this rejuvenating sojourn! The vegetable juice is organic too, with freshly grown celery in tiny squares at the further end of the property.Most of my meals are either in my balcony or in the lawns, because honestly, I never felt like leaving the view of the Ganga even momentarily. Chef Rajendra at the Glasshouse is the oldest in the Neemrana chain and is trained by French chefs, which explains the impeccable taste of desserts and continental cuisine at the buffet spread. Local Garhwali cuisine is a hit for me, less on oil and spices, with a homely touch. The rich and heavy paneer can take a break, while I savour the traditionally made Parwal (pointed gourd) and Tori (snake gourd). The hotel serves mainly buffet. A la carte is available but the buffet is more economical than it. Fresh lettuce under my balcony! Having bought and used Forest essentials products before, I was particularly excited about visiting the Signature Spa of Forest Essentials at the Glasshouse. The company specialising in Ayurveda, was founded by the famous Ayurveda aficionado Mira Kulkarni, making premium beauty products for Indians with organically grown, pure raw materials including herbs, plants, flowers and essential oils. Floral patterns and pastel hues welcome you at the Amrit Kashi Spa, the only Forest Essentials Spa in India. I hover around the store to see familiar products, orange peel Ubtans, floral face mists and the 24 carat gold cream Saundarya, before deciding on the treatment. Arshdeep, the spa manager tells me that most of the ubtans, scrubs and pastes used for the treatment at the spa are freshly pounded. Manisha ji, the most senior therapist at the spa suggests an aromatherapy oil massage, preceded by Eucalyptus steam.She gauges the aches with precision as she works wonders with her hands, working on the painful knots as I fall into a deep slumber listening to the mystic chants playing in the background. The whiff of Eucalyptus stays with me for a long, long time, as I step out of the spa to be greeted by the roaring Ganges again, a reminder of how nature and nature’s bounty offers the best therapy. Read a book on the rocks or on the hammock : It is the perfect place to catch up on reading with chairs on the promenade overlooking the Ganga, or on a hammock in the lawns or at a private beach where you can sit over the rocks in solitude. Pebble therapy: While you are at the private beach, it is a good idea to indulge in some pebble and river therapy by walking over the smooth river bed pebbles and let the river waters caress your feet. Nature’s very own exquisite spa. Write , sing, meditate, dance: The place is a haven for creative souls. With the song of the Ganga and birds as a stimulator, the property provides an exemplary ambience to let the creative juices flow, in peace and serenity. The rocky beach of the Glasshouse is therapeutic! Attend the Ganga Arti: At 6 pm, the priest at the in house temple, does the Ganga Arti, in a simple albeit divine way. (with lesser crowds) In house guests get to take part in the Arti proceedings as twilight falls, making it a memorable spectacle. Go fruit picking (seasonal) : I ask Mr. Gajendra if the guests can get to indulge in a fruit picking session when the litchis and mangos are in full bloom. Special guided sessions can be arranged on request for kids and adults who want to relive their childhood. Rajaji National park : For wildlife lovers, Rajaji National park near Rishikesh is a great option. The Cheela gate is 2 hours away from the property and one can book safaris at the gate either at 6.30 am or 2.30 pm. The park offers spectacular landscapes (lush green forests and dry riverbeds) and sightings of wild elephants, leopards and a variety of deer and birds. Visit Neelkanth Mahadev : A one and a half hour drive through the hills ahead of Rishikesh , takes you to Neelkanth Mahadev, an ancient shrine dedicated to Lord Shiva. It is believed that this was where Lord Shiva consumed poisoned that gave him the title of Neelkanth (the one with a blue throat). Adventure: Rafting, zip lining, Bungee jumping: For the adventure junkies, there a host of activities in Rishikesh to give you an adrenaline rush. 6 Kms away at Shivpuri, there are several white water rafting operators an also zip lining over the Ganges. Forest walks: The property arranges short treks around the property for birding and nature enthusiasts. This includes a 2 km walk and an 8 km long walk that takes you through the local villages in the vicinity and over suspension bridges. As I stood at the banks of the Ganga on the private beach of the Glasshouse, my conversations with Ganga continue. I sat conversing with it for a long , long time. Just like me: happiest in the hills, away from the maddening city. Glasshouse on the Ganges is a Neemrana property and is situated 26 kms from Rishikesh and 65 kms from Dehradun. It is on the Badrinath road and the nearest airport is at Dehradun. Disclaimer: I was hosted by Glasshouse on The Ganges in Rishikesh by Neemrana Hotels, but the views as always are my own. I haven’t been to GHoG but some of my cousins did and they loved it! I have been to a similar place towards Devprayag and I loved it. My only fear is that I can’t get over images from 2013 UK mayhem. I don’t think I can sleep peacefully in the room/cottage near the river bank. Somethings are hard to erase! Happy to know you loved your trip thoroughly. That’s the first thing I asked the staff and they described it saying how there was no damage to the property nor the guests here coz of timely precautions. The Ganges at Rishikesh is just beautiful and serene, isn’t it? I can go over and over again, each time discovering a new side of myself. The property sounds heavenly, maybe I should plan a trip to visit the Neelkanth temple and also stay here at GHoG. So glad you had a fantastic trip! love the article, your words took me straight there and reminded me my time spent at Rishikesh. The property offers awesome views 🙂 Thanks so much Mayuri! Glad it made you revisited! Thanks a lot Purba! 🙂 Glad you liked it! I could almost smell the fresh scent of Eucalyptus and hear the happy happy Ganga as I read through your post, Divsi! Amazing, how close the tents are to the river and so glad the bed didn’t hurt and your time at the property made you feel like a princess. As for the river, your words (and pictures) brought her to life! I love Rishikesh and this seems like a great place to stay. Yep 🙂 Away from the chaos. Good for a detox! This is a beautiful sum up of the entire tour and love the way you have written everything about the place. Book marking this for my visit. Loved your description of the revered Ganges and fond memories of Rishikesh.And, the property looks spectacular ! Thanks for reading Meenakshi! 🙂 The property is gorgeous! Such a heartfelt post, I could seriously feel the tranquility and serenity. Thanks Ruby 🙂 The Ganga here is indeed serene and pure! This looks like a beautiful spot on the Ganges. I love the look of the tents right next to the water. .This is getting back to nature in style and is just perfect for me! Oh my god, never seen this aspects/side of the Ganges before and now I would love to check this out and hike all over. Nature and lakes, thats my favourite. Fantastic read. Glasshouse on the Ganges certainly does look like it is/was fit for a king. I think I’d feel like royalty there, especially with that view and the spa. Absolutely. The place is a luxurious retreat! Your photos are so pretty! I want to go so bad now. I love how blue it all is. I really want to visit the Ganges sooner rather than later. Thank you so much Nathan! 🙂 It is the cleanest up here before she flows down into the plains! What a beautiful spot! Wow! I’d love to stay here. Since I like taking in the sites near a local (plus it is so beautiful I’d have a hard time getting in a car and driving for two hours), I’d opt for the guided short hikes around the property. Hopefully my travels will take me there one day! Thanks so much Lara. Yes it is the perfect spot to stay put and soak in the peaceful vibes! I had my eye on the swing hammock outside the luxury cottage! Would love to chill on that and look out at the view. The national park looks incredible as well, hat’s off to a great trip! The place looks amazing, especially with the balcony in the rooms offering such great views. Proximity to the river definitely is the big positive and the food looks pretty awesome too. I would love to just sit by the riverside, with a book or some music, and relax. I can;t believe I have not yet tried white water rafting in Rishikesh. You will absolutely love rafting in the Ganga! 🙂 It is an experience of a lifetime! I would totally go picking fruit! Lychees are one of my favorites! Beautiful post! I would love to wake up every morning with the views from that balcony and enjoy nature. I hope to travel there one day. Hope you get to go there soon! 🙂 Thanks Laurel! Wow! Such a relaxing place to spend a vacation! I really love all of the photos, they are all perfectly captured. I am in love also with the photo wherein you are watching the river flows, for me I would like to visit here and try it also to be relaxed. Such a lovely hotel you stayed at and the foods looks so scrupmptious. Thank you so much Ghia!! <3 🙂 Glad you liked it! One of the best things about India and especially Ganga is that every place it flows through gives a different view. I followed your Insta stories and it was amazing. This place seems a wonderful place to spend time away from the city. That is so true.. A different perspective in every city… Thanks Atul 🙂 It was a lovely getaway! What a property! Zero pollution environment, fantastic views of the Ganges and the river, pebble therapy, homely meals. The Glasshouses looks and sounds like a perfect place for a retreat from busy city life. The Glasshouse on the Ganges, off Rishikesh sounds like a fabulous property – and I would definitely wake up early to soak in that view! The sunrise is so beautiful – what ti would be to witness that in person! Even better from a private balcony 🙂 The rooms look really nice, but I think I would be keen to stay in one of the tents. I’m a big fan of glamping at the moment, so this would be perfect! This is such a rich experience. I always love revisiting places in different stages of life. Each time you see the place a newer perspective. The water looks so pure and undisturbed. I love that the vegetables are grown right beneath your balcony! What a cool experience to truly dine garden to table like that. Everything looks so beautiful and I’d love to go here. Thanks for sharing! The Ganga is beyond gorgeous. I love the feel of the river. Fascinating, colorful, peaceful and as noted, zero pollution environment here. Reminds me of the pristine hill region in Costa Rica. So much to see and enjoy. Wow! The views at your private balcony are stellar! I don’t think I could ever get any work done there if I were you hahaa. The room looks amazing too, sorta has an Alice in Wonderland feel with the tal and checkered tiles. Sounds like an amazing hotel to stay at and I can’t get over how green Ganges is! Stunning! Wow – didn’t realize the Ganges had such beautiful turquoise water! You did a great job capturing the scenery and the lovely colors. Would enjoy going on a rafting adventure there! The water just looks SO pristine! Wow, what a beautiful and fascinating part of the world. You’re a beautiful writer 🙂 I’m adding Ganges to my list. This place from every angle looks like a postcard. I love the sounds of all the activities you’ve recommended. We love our activities, but like you suggest, just relaxing with a book or by the river is satisfying enough with views and atmosphere like that. I love Rishikesh and have been there a few times. The atmosphere has a feel of mysticism there. I had been to Neelkanth Mahadev through Rajaji National Park. It’s a lovely route.